This is a book I've had my eye on for a while, so when I found out my local library was able to get it in for me, I couldn't wait to get stuck into it. Firstly, I want to start by saying that this book looks beautiful. This was the hardback edition and the black and white illustrations throughout the whole thing are absolutely stunning. Also, the Author's Note at the beginning was very moving. 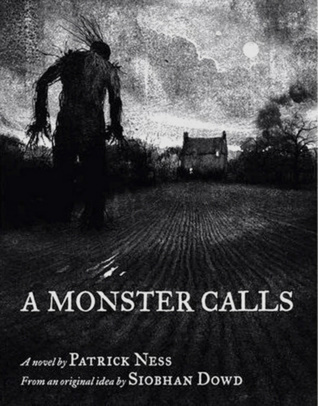 I think Patrick Ness did an amazing job with this book and he should be very proud of himself. Now, the story. Wow. Beautiful. Sad. Thrilling. Moving. Just, wow. I was so captivated by Conor's story that I found it hard to put the book down and ended up reading it in two sittings. Conor is a young boy with a very sick mother. She has cancer and as sick as she becomes, he's determined not to face his nightmares and keep believing that she'll be okay. But when a monster--who also happens to be an ancient yew tree near his house--comes calling, his whole life changes. This monster wants to tell him three tales in exchange for one of Conor's. He also wants the truth. But more than anything, he wants Conor to face up to his nightmare and accept the truth for himself. I have to admit that this story made me shed tears. It's beautifully written and I felt everything poor Conor went through. I'll never forget this tale, and I'm pretty sure I'll be buying myself a copy of this book to put on my keeper shelf.